This week’s Fabulous Find is the type of item that can be thrown over anything from a sundress to a graphic tee and instantly create an effortlessly stylish vibe – a denim vest. This particular vest, from Target, is a versatile light wash and has a classic, clean shape, meaning it won’t go out of style anytime soon. Plus, vests can be worn from summer right into autumn meaning you’ll definitely get your money’s worth with this budget-friendly layering piece. Make your fave LBD daytime-appropriate with this first ensemble. We started with a trendy maxi dress with a sheer overlay, but this look can work with any black frock. 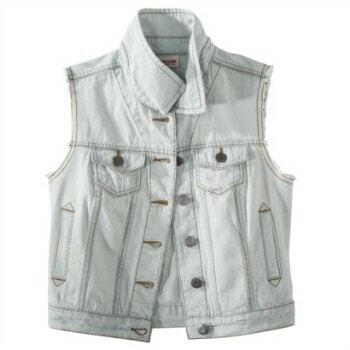 Layer on the denim vest, then add pair of sandals that had a hint of bold color. Go edgy with the jewelry – a pair of leopard studded earrings and a layered necklace give the outfit a cool vibe. Lastly, grab a metallic envelope clutch for a glam touch. This casual, yet polished outfit would be ideal for an afternoon spent shopping or grabbing coffee with your friends. 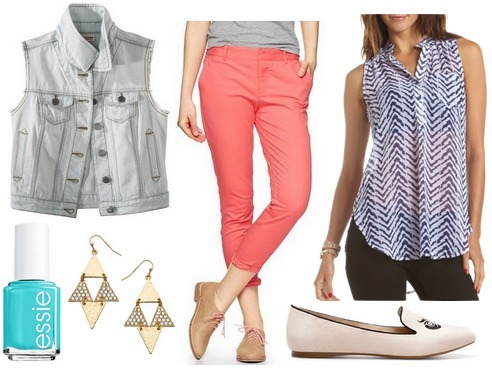 Start by pairing some coral-colored trousers with a chevron-print blouse. Add our Fab Find, as well as some neutral loafers for a comfy, yet stylish look. Accessorize with a pair of statement earrings, then paint your nails a contrasting shade of blue for the finishing touch. Our final look is the kind of outfit that can easily work for day or night. Pair the vest with a graphic tank and a printed skirt for a fun and edgy vibe. Mini wedges are a comfortable choice that still add a subtle boost of height. Add a cobalt blue cross-body bag and accessorize with several stacked bangles to complete the ensemble. What do you think of this week’s Fabulous Find? Would you buy this vest from Target? Which look is your favorite? How would you wear a denim vest? Remember to leave a comment below and tell us what you think!